With kids now going back to school across Europe, many parents will perhaps be reminiscing on their summer holiday in the Mediterranean and how nice everything was. They might even think about living there (that’s the dangerous thing about holidays – they tend to force a what if rethink in people’s minds). Southern Europe wouldn’t be a bad choice, either: the latest InterNations Quality of Life Index shows that Portugal and Spain have the best standard of living rated by expats in the world, divided only by 2016 winner Taiwan (which is also a wonderful destination, albeit for different reasons). On that point, it’s interesting to see blocs in the index – Denmark, Sweden and Finland are bunched together, as are Germany and Luxembourg. It does feel a little like a Eurovision Song Contest of living standards. Portugal’s success, coming a year after the nation won football’s European Championships, shows the country on the ascendancy. Perhaps. It might not be a surprise to the organisers of the amazing coworking retreat Offsite Immersive in Guia, offering a pool and a nearby beach. Overall Quality of Life aside, the Quality of Life Index grouped countries under five categories: Leisure Options, Personal Happiness, Travel & Transport, Health & Wellbeing, and Safety & Security. InterNations polled 12,500 expats of 166 nationalities based in 188 territories and asked them to rate 43 aspects of life overseas. It’s a new year and a new start for many, who will be assessing their lot in a rapidly changing world. Few things can be relied on anymore, from job security to political stability. Brexit is naturally forcing a rethink among people resident in the UK, and the US has surprisingly and controversially introduced a travel ban. And it will likely get more problematic still. Amidst so much uncertainty, the pursuit of quality of life by international migrants almost seems a luxury. Never mind children’s education, decent healthcare and hours of sunshine; how about just holding down a job and being allowed to stay in the country? It’s a question I’m pondering as I’m scanning the latest Quality of Life Index from InterNations. Nine EU destinations, are listed in the top 20. With the UK hellbent on leaving Europe and burning bridges, British passport holders might want to reconsider relocating to any of these countries long-term, at least until visa and travel rules become clearer. Beyond the EU, two neighbouring East Asia countries sit in the top 3. Taiwan tops the index of 67 countries, with a whopping 99% of respondents rating their personal safety favourably and 89% reporting satisfaction with the territory’s peacefulness. Japan was in third, with those polled rating it highly for transport and again peacefulness. But again, with tensions rising over the South China Sea, and Trump irritating China over Taiwan, the situation in East Asia is looking pricklier than usual. As for last year’s index winner, Singapore, the city-state dropped to eight in 2016., while still ranking first for Travel & Transport. 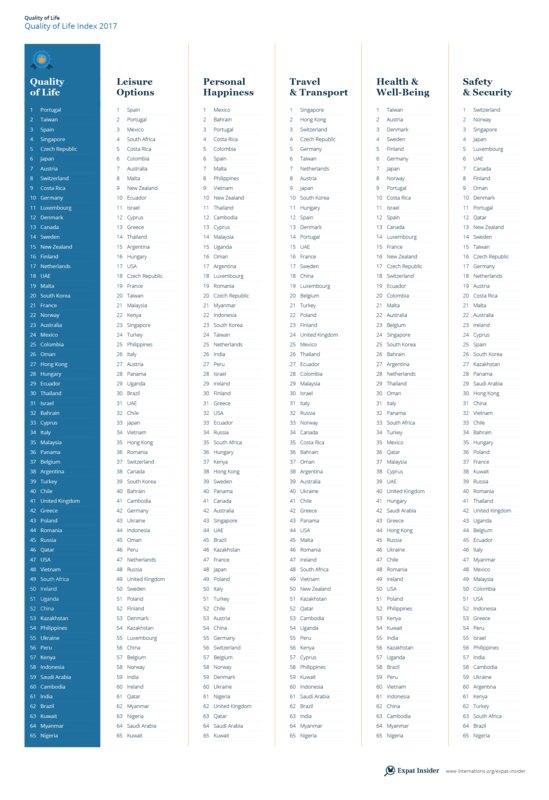 And finally, the countries to avoid (you might also want to add the US if you hail from a Muslim-majority country): Nigeria is worst for quality of life, followed by Mozambique and Kuwait.